Hands On Bike: Part 5: Cheap Bikes vs Premium Bikes: What is the Difference? Part 5: Cheap Bikes vs Premium Bikes: What is the Difference? The better your brakes, the faster you can go! 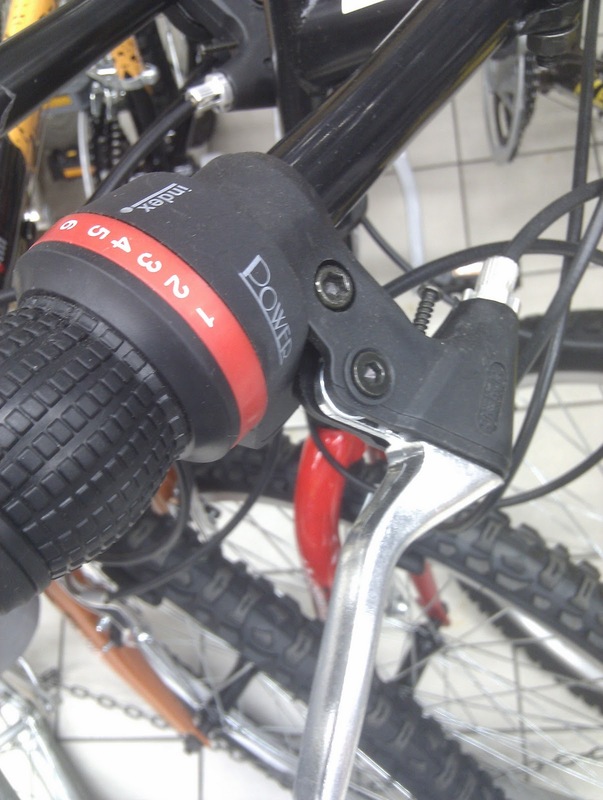 Brakes on a bicycle are often overlooked, and are unlikely to be the first components that are upgraded. Usually, the first components that are upgraded would be those that can make you go faster, such as lighter wheels, slicker tires, stiffer cranks etc. However, brakes are also very important, as a good set of brakes are necessary to allow you to cycle fast, with the confidence that you can stop when you need to! The folding bikes that we are looking at are the Aleoca Ready2Ride (R2R) and the Dahon MuP8. Both look similar, but have a big difference in their price tags. And why is that so? Start reading from the first part to find out! 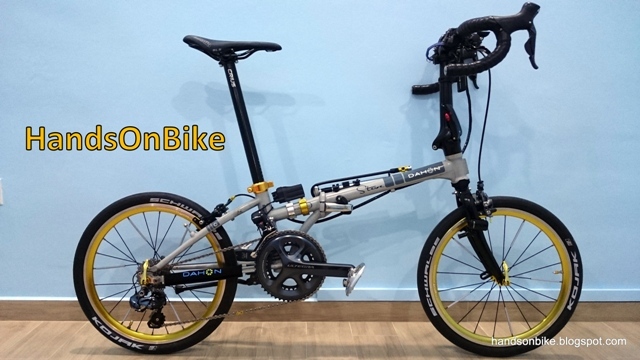 Today, we shall compare the braking system used for these two folding bikes. Both the bikes use V brakes, which are very common on bicycles nowadays. And no wonder: V brakes are cheap, effective, lightweight and relatively easy to adjust. For folding bikes, V brakes are sufficient most of the time, unless you are going for a road bike setup with caliper brakes, or plan to go off-road with disc brakes. Whenever you brake, your fingers come into contact with the brake levers. 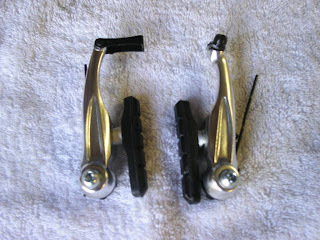 It is the component that you will come into contact with most frequently, after the grips, pedals and saddle. A good brake lever will feel solid and flex-free, with no mushy feeling when the brakes are applied. This is where a great deal of cost savings were made, when the brake levers for the Aleoca R2R was selected. The plastic used for the brake lever bracket feels cheap and is flexy when braking hard. Also, a plastic bracket will be more likely to get damaged than an aluminium bracket. The Avid FR-5 used on the MuP8 is a much better brake lever. In fact, Avid makes one of the better brake levers out there, with their Avid V-brakes being a very popular choice for upgrades due to its affordable price and surprisingly good quality. 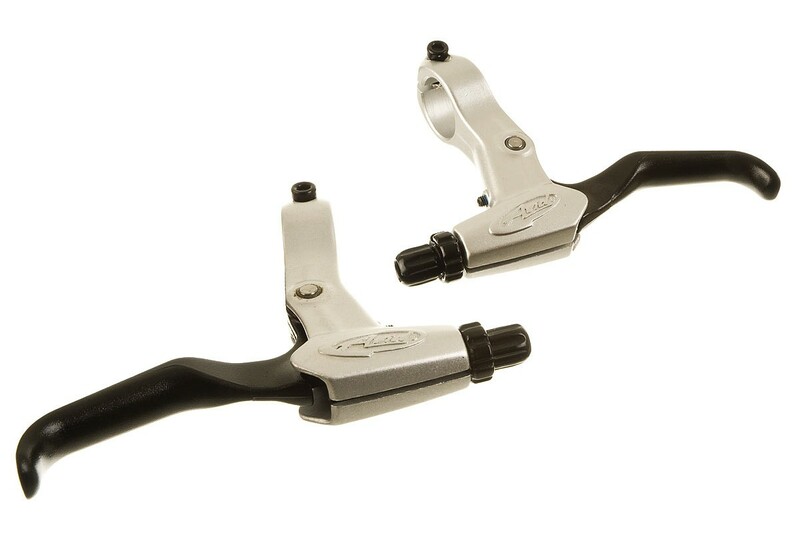 The Avid FR-5 brake levers feel really solid and reassuring, with smooth pivots and very little flex. There is seriously no need to upgrade your brake levers if you already have Avid brake levers on your bike. This is the most underrated component on the bicycle! It does not contribute to speed, you cannot shave weight by upgrading it, and you hardly notice it unless it is gone. 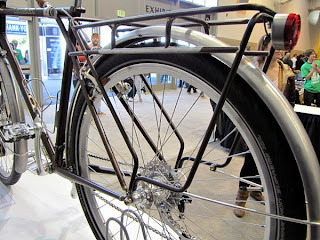 Which is why many bicycle OEMs save costs by using cheap housings. After all, the customer cannot tell the difference just by looking at the housing! However, the housing actually plays an important role in ensuring friction-free braking. A good housing will have a well lubricated plastic liner inside the coiled housing, that minimizes friction between the brake cable and the brake housing. If you have ever pulled on a brake lever, and it feels smooth and predictable, that is largely because a good brake housing was used. Jagwire is the biggest cable housing manufacturer in the world, and you can find Jagwire housings on many good quality bikes. Many aftermarket brake cable housings are Jagwire housings too, with Alligator, Nokon, Goodridge and Clarks being some of the other well known brands. If your brakes still does not feel smooth after you have upgraded your brake levers and calipers, changing your brake housings may just do the job! You will be surprised how much difference a good brake cable housing can make to your braking feel and performance. 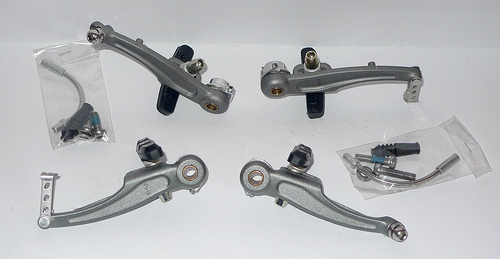 I have come across many V brake calipers, and they mostly look the same. However, the difference between them lies in the parts that you cannot really see. Examples are the springs that are used, the bushings in the pivots, the bolts that are used, the brake noodle linking the brake housing to the brake caliper etc. I did not know they still made brake calipers in steel until I was doing research for this article. Not sure why steel is still used, because aluminium brake calipers are so much lighter and can do the job just as well. Maybe it is because steel calipers are cheaper to manufacture than aluminium ones. Anyway, besides the weight penalty of using steel brake calipers, a good pair of brake calipers is usually only obvious after a period of use. The first thing you notice is that a good set of brake calipers will not rust. The bolts and the brake noodle will be made of stainless steel, which is more expensive than plain steel but has the important advantage of being rust-free. Another thing you will notice is that a good set of brake calipers will improve the smoothness of your braking, as the better bushings in the pivots will reduce friction. It will also be easier to adjust the spring tension on either side of the brake calipers without repeated back and fro adjustments. 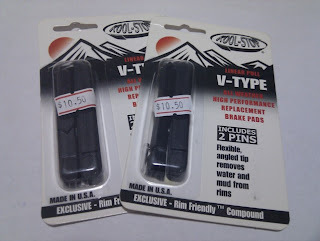 There are also other small details that you can use to differentiate between a high quality and entry level brake caliper, but it is too lengthy and difficult to show these clearly in a blog post. Perhaps it will be easier to point them out on the actual brake caliper itself! This is one component where there isn't much to compare. 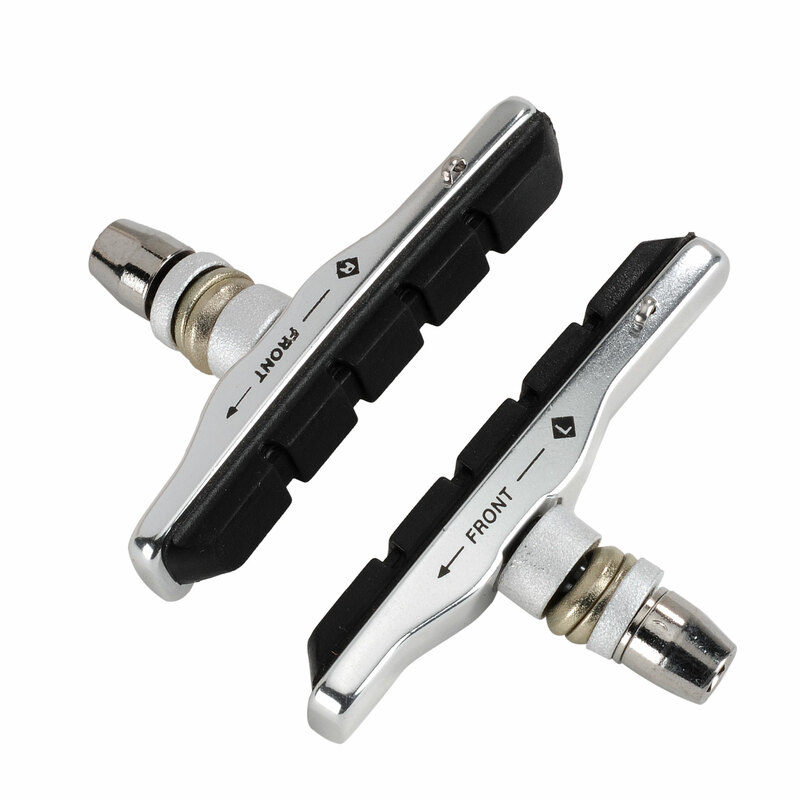 Neither of the bikes use good quality brake pads, which is surprising for a premium bike such as the Dahon MuP8. I would have expected the brake pads on the MuP8 to be at least a cartridge brake pad, so that the brake pads can be swapped out easily. However, it comes as an entire block, which means that if you want to change the brake pads, you have to change the entire brake pad assembly. Cartridge Brake Pads. Brake pads can be swapped out by sliding the pads out of the aluminium pad holders. The stock brake pads are not really good, and most of them tend to squeal terribly, especially after a ride in the rain. What is worse is that during braking, metal bits from the rim will embed themselves in the brake pad, and wear away your rims. This can be seen by grooves cut into the rim by the brake pads, and if it gets really bad, you can hear scraping sounds when you brake. 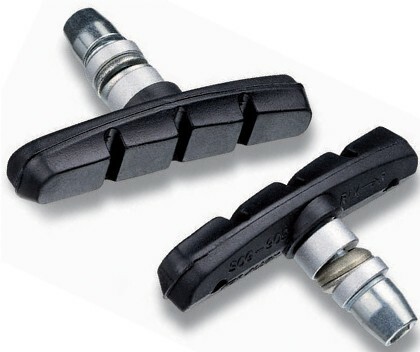 As a solution, I recommend the Kool Stop brake pads. They are rather pricey, but what you get is good braking performance and squeal-free operation. Most importantly, they will save you from having you change your worn-out expensive rims! After comparing the brake systems, it should be clear that the different quality of brake components used is one of the reasons why the Dahon MuP8 costs more than the Aleoca R2R. With a better brake system, the braking performance is smoother and lighter, more reassuring and reliable, and the components will not rust over time. If you are a rider who cycles often, you will definitely appreciate the difference. In the next part, we will examine an utterly confusing but hugely interesting part of the modern bicycle: The Gear Shifting System. very very insightful as i'm a noob..
and proud at the same time , as i'm a MuP8 owner.. I just put down a deposit for a tern then I realised I am pretty heavy and has pass their stipulated weight limit. reading through your blog post, I want to ask this. if i just want to buy an Aleoca to start on foldie and then not mind the longevity of the components, and assuming I don't mind the weight of the bike, structurally, hi ten steel should be ok huh? it's not all about material. engineering plays a big part too. not sure about the construction of Aleoca, but I'm sure it does not have a higher weight limit than a well built Tern. if you don't mind components breaking down within a year, don't mind changing the bike in one year, don't mind regretting your decision, then by all means get a cheap folding bike. Cheap not good, good not cheap. DO u think Avid FR3 vbrake much better than Tektro Aloy vbrake? I somehow feel mushy on my Tektro vbrake and has very less confident riding downhill a steep mountain. Are you referring to the brake lever or the brake caliper? For the brake lever, try moving the lever up and down. A good quality one will have little play. Just compare a Shimano brake lever to a plastic one you see on a supermarket bike and you will know the difference. I have not heard about the Garion folding bikes, so I can't comment on those. I believe you should get a better folding bike to enjoy cycling. Even entry level Dahon folding bikes are much better than most other brands. If you ride a poorly designed folding bike, it will not be fun, as components will start to break down within a few weeks.